I was born in Allentown, PA, learned to fish there until I moved at the age of 15. Colorado has been my home since 1981, and I've called Vail home since 1988. 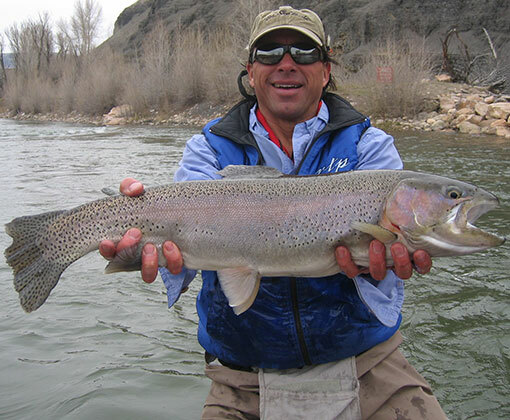 I've been guiding people in Vail as a ski instructor for nearly 30 years, and on the rivers in the area since 2012. I am also an adjunct professor for the local Colorado Mountain College, and fly-fishing is one of the classes that I help teach. I am also the lead instructor and guide for our Fish-n-Chicks program. In addition, I am a Boy Scout Leader and have led many trips for our local Troop 231. I have fly-fished since I was 10 years old, and started tying my own flies at 11. I have fly-fished all over the USA in places like Washington, Alaska, Florida, Hawaii, Montana, Wyoming, Minnesota, New Mexico, Pennsylvania, and of course Colorado! My international/saltwater fly-fishing experience has been in Costa Rica, Belize, and Mexico. In Costa Rica, I caught Sailfish on a fly, in fact three in one day! It was unreal. I want to fly-fish in Patagonia, and will be returning to Alaska for some more of that action! Nordic skiing, (tele, skate and cross country), cycling (mountain and road), fly tying and waterfowl hunting. I help teach College Physics at one of the local high schools, and I am a Field Paleontologist for the Denver Museum of Nature and Science. We dig for dinosaurs! I love to teach and I love sharing outdoor experiences with others. Guiding allows me to do both of these things at once. My goal for my clients who visit from out of town is that I want their time with me to be the highlight of their trip that they tell their friends and family about when they return home. It's my measure of success. Michele and I want to thank you for the very nice note you sent us. Please know that we felt it could not have been a better day thanks to you and all the help from Max. You have great kids and should be very proud of how special they are. Yes, the fishing was good, however the day was about much more than fishing as you know. All the effort, caring and attention to detail made for a great day and one of the best outdoor experiences we have shared together. Hopefully, we can get out with you again in the near future. We were able to access the pictures you attached and certainly appreciate them and Max's photographic talent. Please thank him for us. The Carole King show was exceptionally good and we are very fortunate to have had two consecutive fantastic days. Thank you so much! I had such a great day - from my course on entomology, to casting at the grill, to the course knowledge on the pond, to your special spot on the Gore Creek - how awesome!